The prompt in the Weekly Photo Challenge this week is the word ‘threshold’. Looking through my photos this one of the tile frieze made at the end of 1999 for the year 2000 leapt out at me. It is hard to imagine today just what a big deal it was being on the threshold of a new millennium. There were all sorts of apocalyptic warnings about power failures, planes falling out of the sky, systems not being able to cope etc. No-one really new what would happen at midnight on 31st December 1999 and what the new millennium would mean for civilisation. So I wanted to mark the occasion with something very special and permanent for my school. St Thomas More School was a huge part of my life. In the early 1970’s I watched the new school building rise in the middle of an open field that had once been farmland and an orchard. There was an ancient hedgerow all around the site and just one magnificent old oak tree in what would be the playing field. When it was opened in 1975, I was having my third child so was not available for teaching. But, as I drove past the school every day, I vowed that one day I would work there. I got my wish in 1984 when my youngest child was ready to start school. I was offered a job and jumped at the chance. The next decade was a time of great blessing as I worked in virtually every class, teaching all age groups, then became deputy Head. In 1994 the original Headteacher was due to retire and, to my surprise, I was offered his job. He had been such an inspirational Head that the school was a joy to work in. Taking on his role, I tried to emulate him while making my own mark and bringing my own vision for the school into being. Due mainly to the quality of the staff and their outstanding teamwork, the school became a strong and successful community, ‘an oasis of excellence’, appreciated by staff, pupils and parents alike. In 1999, as the new millennium approached, the staff wanted to mark the year 2000 with a special feature. We wanted the whole school community to be involved in creating something totally unique and meaningful. We came up with the idea of making a large tile frieze. Each year group was asked to brainstorm their favourite lessons, subjects, or topics, and represent their ideas on paper. Reception class, the youngest children were just 4 or 5 years old and had only just started school. They had their photographs taken in their shiny new uniforms, so that was their contribution. The Year 1 class had helped to build a pond and were raising ducklings which they had hatched from eggs in an incubator, so they drew pictures of that. I have a wonderful memory of the day the ducklings hatched out ~ the local policeman had called up to the school on a social visit and he watched as the first duckling struggled to crack open the shell. When it finally succeeded and out popped this beautiful and perfect little bundle of yellow feathers, he was overwhelmed by emotion and had tears in his eyes. In Year 2 the 7 year olds made their first Holy Communion as it was a Catholic school so they drew a chalice and host. Being the most significant event in the year, that was their contribution. Year 3 was the first year of juniors and the children enjoyed learning about Vikings and the Human Body, so they drew lovely longboats and skeletons. In Year 4 things got much more subject focussed so Maths was represented by a calculator and mathematical symbols. In Year 5, Music, Dance and Art were the main features, so a pot of paint and a brush was drawn. Science too was represented by the planets. By Year 6 the children were getting ready to move on to secondary school. In order to give them a taste of independence and adventure, it was our tradition to take the class away to Shropshire for a week to stay in a Youth Hostel. Here, in the Ironbridge Gorge, birthplace of the Industrial Revolution, we had a wonderful time. We visited the Iron Museum, The Jackfield Tile Museum, Blist’s Hill Reconstructed Village, River Severn Museum and of course the first Iron Bridge ever built. We also had amazing night hikes, midnight feasts and parties. Altogether it was an incredible opportunity for fun and learning. So naturally the Ironbridge at Coalbrookdale was the emblem of Year 6. The staff gathered all these pictures and images together and chose the ones that would be painted on to the tiles. The Year 5 teacher, ABW, a wonderfully creative artist and teacher, took on the challenge of putting all the ideas together and creating a design on tracing paper which could be transferred onto numbered ‘green’ tiles. It was agreed that we would go to Jackfield Tile Museum to create the finished work. A representative group of staff, parents and children spent a weekend at the Youth Hostel and were each given a small area of the tile frieze to paint. ABW had done a magnificent job scaling all the children’s artwork up or down so that the frieze would reflect the life of the school. It was agreed that the year 2000 would go at the top, as well as the 4 trees, oak, ash, poplar and beech, which were the school emblem. In the top corners would be tiles depicting the Ironbridge itself. The children’s artwork would go around the edge, and at the centre would be the Holy Spirit in the form of a dove surrounded by flames. We painted the tiles in coloured glaze. I will never forget the atmosphere in that studio at Jackfield as we worked on the frieze. There was a stillness and peace in the room which was truly sacramental. While we worked, the Spirit moved in that place and heaven happened. When we finished, the tiles were left at the Jackfield tile Museum to be fired. A couple of weeks later they were collected and set into a frame made by the reception class teacher’s husband. 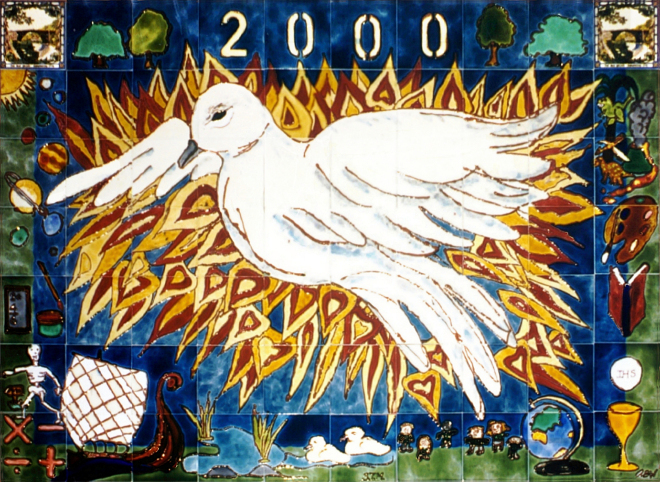 Bishop Mervyn Alexander of Clifton RIP came in the year 2000 to celebrate the school’s 25th anniversary and he blessed the tile frieze. Although most of the staff who worked at the school have retired or moved on now, the frieze is still there in the school hall. And with it is a little piece of all of us who made it. This entry was posted in Creativity, Education, Photography, Spirituality, Weekly Photo Challenge. Bookmark the permalink.